There is mixed opinion on the use of headphones/music while running. Some races don't allow it, and some do. I always run with music (set to a volume where I can easily hear traffic), and the few times I've tried to run without haven't been as enjoyable. I usually run with electronic dance podcasts, but I knew for the half marathon I wanted to have songs that were both familiar and motivating. 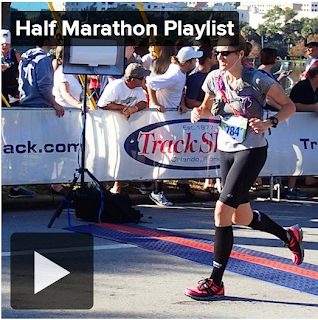 I've discussed the importance of mantras and positive self-talk, and I was super pleased with my music selections when I was out on the course with a side stitch and feeling miserable. There were so many moments where I felt bad or overwhelmed or like I wouldn't make it and then a song lyric would pop through my headphones and give me a little push. I wanted to share my playlist with you.